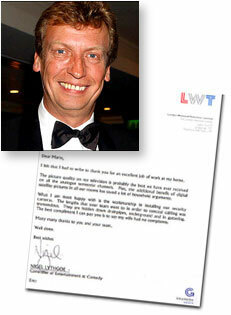 Nigel Lythgoe, creator of hit TV shows including ‘Gladiators’ and ‘Pop Idol’, chose CAI Vision to supply and install a CCTV security system, and to provide each bedroom with a digital satellite feed. I felt that I had to write to you for an excellent job of work at my home. The picture quality on my television is probably the best we have ever received on all the analogue terrestrial channels. Plus, the additional benefit of digital satellite pictures in all our rooms has saved a lot of household arguments. What I am most happy with is the workmanship in installing our security cameras. The lengths that your team went to in order to conceal cabling was tremendous. They are hidden down drainpipes, underground and in guttering. The best compliment I can pay you is to say my wife had no complaints. Many, many thanks to you and your team. Nigel is now a longstanding client, and we have also added extra equipment to his UK home so he could watch English television whilst working in Los Angeles.